Life Is What Happens: Nailed it!! 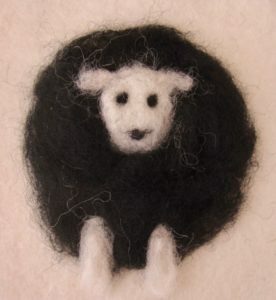 I have delayed creating a video to “finish” my new site Feltedfibre.com. Why? Well, I hadn’t created a video in a few years and there was this “fear” of getting back into it – you know – the learning curve, the setting aside of time, the awkwardness of hearing your own voice, and the emptiness of talking to the void. Believe me I ‘ve had dozens of excuses for “not getting started.” However, there was also the peer pressure. Yes, it happens even out of your teens I had been asked to join a blogging group and my excuse for delaying was that I hadn’t finished my site and I wanted to be part of the group as “Feltedfibre.com.” However, I would be there soon. Soon does happen, often sooner than you think! Although I did remember to charge the battery on my camera and empty the image card, I had forgotten that a 4 gig card wasn’t large enough to store my ramblings – off to Staples for a larger card. Again, although I did have several finished samples of the project I was about to film, I realized I needed more (don’t we always need more). So back to the felting pad, needle and fibre to create a few more samples. The final road block, however, were the nails – fingernails, that is. I have gardener’s nails – chipped from weeding, discoloured by earth and distorted from, dare I say, neglect. Enter the MANICURE!!. My daughter had several places to recommend that were walking distance away. I had the $35.00 or so to spend; I even had the time to spend. However, I did have the logic to know that I would be gardening the next day and why waste money on something that would be destroyed in 24 hours. Anyway, I didn’t want talons, I just wanted tidy!! 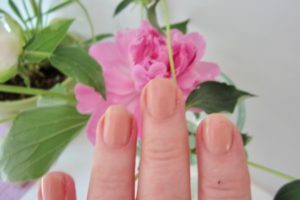 It took a few minutes, but I found some clippers, an emery board and a relatively new bottle of nail polish – stage makeup for the hands. 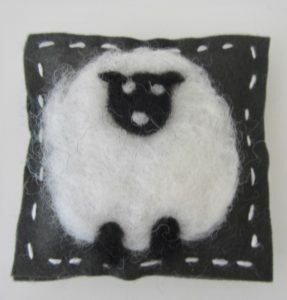 How to needle felt on fabric.